PBA Semifinals News 2018: Magnolia Hotshots booted out Barangay Ginebra, 112-108 to book a Finals ticket in the 2018 PBA Governors’ Cup this Friday at the Ynares Center. Import Romeo Travis bucked a hamstring injury to lead the Hotshots with 50 points and 13 boards, while Ian Sangalang made 14 points and 6 rebounds. ➤ With 10 ticks remaining in regulation, both Scottie Thompson and Joe Devance miffed their clutch trey attempts and failed to salvage Ginebra in crunch time. The Gin Kings were effectively eliminated from campaigning for a third straight title this season. ➤ Justin Brownlee backstopped the losing Gin Kings with 32 points, 9 caroms and 7 dimes, while Japeth Aguilar chipped-in 25 buckets and 14 rebounds. ➤ Magnolia will get a long rest as they await the other finalist between the Meralco Bolts and the Alaska Aces, who will battle in Game 4 of their semifinals series on Saturday, November 17, at the Cuneta Astrodome. Quarters: 20-27, 51-53, 81-79, 112-108. Travis 50, Sangalang 14, Lee 11, Jalalon 9, Barroca 8, Herndon 8, Simon 6, Dela Rosa 4, Reavis 2, Brondial 0, Melton 0. Brownlee 32, Aguilar 25, Tenorio 12, Thompson 12, Devance 11, Slaughter 7, Mercado 5, Mariano 2, Chan 2, Ferrer 0. PBA Semifinals News 2018: Barangay Ginebra stayed alive, after defeating the Magnolia Hotshots, 107-103 in Game 3 of their 2018 PBA Governors’ Cup Semifinals tiff this Wednesday at the Araneta Coliseum. Star import Justin Brownlee wowed with career-high 46 points and 19 boards for Ginebra. ➤ LA Tenorio finished with 14 points and 5 rebounds. He also shot the clutch floater off Paul Lee’s turnover, with 14 seconds left to lift the Gin Kings, 105-103. ➤ Scottie Thompson also added 15 buckets and 7 caroms, while Japeth Aguilar finished with 11 markers and 7 rebounds. ➤ Ginebra bucked an 18 point Magnolia half-time lead and survived another day in their Semifinals series. Magnolia led the Gin Kings in most of the game stats, but Ginebra outpaced the Hotshots in charities, hitting 32 of 45 foul throws at 71 percent, compared to Magnolia’s 11 of 18 free-throw shots made at 61%. 11/18 (61%). ➤ Mark Barroca led the Hotshots with 19 points and 5 rebounds, while Lee made 17 points. Import Romeo Travis was the missing link for Magnolia, who managed to register only 12 points and 12 boards total. ➤ Magnolia is still leading the series at 2-1, and Barangay is in a must-win situation in their upcoming face-off this Friday, November 16 for Game 4 of their Semifinals showdown at the Ynares Center. Quarters: 23-22, 41-58, 79-81, 107-103. Brownlee 46, Thompson 15, Tenorio 14, Aguilar 11, Devance 8, Chan 5, Slaughter 3, Mercado 3, Caperal 0, Ferrer 0. Barroca 19, Lee 17, Sangalang 16, Travis 12, Brondial 10, Jalalon 10, Dela Rosa 8, Simon 5, Reavis 3, Melton 3, Herndon 0, Gamalinda 0. PBA Semifinals News 2018: Magnolia Hotshots halted Barangay Ginebra, 101-97 to surge ahead to a 2-0 lead of their Semifinals showdown in the 2018 PBA Governors’ Cup this Monday at the Araneta Coliseum. Reinforcement Romeo Travis led the Hotshots anew with his 25 buckets, 12 caroms, and 7 dimes, while Ian Sangalang added 17 markers. ➤ Paul Lee also contributed 14 points as well as Rome dela Rosa who made 11 buckets for Magnolia. ➤ Magnolia had better command and defense of the court, making 26 assists total against 19 by Ginebra. They also stole the ball 10 times opposed to the Gin Kings 6 steals, resulting to 23 Ginebra turnovers total. ➤ Coach Tim Cone of Ginebra was ejected in the third quarter after incurring two technical fouls. ➤ Import Justin Brownlee made 31 buckets, 12 boards and 7 assists for the Gin Kings, while LA Tenorio and Japeth Aguilar chipped-in 15 markers apiece. ➤ Ginebra will need to win their next face-off with Magnolia on Wednesday, November 14 at the Araneta Coliseum to keep their hopes alive in the Best-of-Five Semis series. Quarters: 21-18, 47-46, 75-68, 101-97. Travis 25, Sangalang 17, Lee 14, Dela Rosa 11, Barroca 9, Jalalon 8, Reavis 6, Simon 5, Melton 5, Herndon 1. Brownlee 31, Aguilar 15, Tenorio 15, Slaughter 14, Mercado 7, Thompson 7, Mariano 4, Caguioa 2, Chan 2, Ferrer 0. PBA Semifinals News 2018: Magnolia Hotshots frustrated Barangay Ginebra, 106-98 to win Game 1 of their 2018 PBA Governors’ Cup Semifinals showdown at the Ynares Center this Saturday. Import Romeo Travis waxed hot for the Hotshots with his 37 buckets and 16 boards, while star guard Paul Lee registered 27 markers. ➤ Magnolia manageably stayed ahead of Ginebra for most of the 2nd half, until the Gin Kings got to within two points, 93-91 with 1:57 seconds remaining. However, Lee showed his clutch arsenal as he dropped a trey and an ‘and-one’ in succession to push the Hotshots ahead 106-96, with 56 seconds left in the ballgame. ➤ Overall, the Hotshots shot better from the three-point territory with 10 of 28 treys total (35%), against Ginebra’s 7 of 25 three-point shots (28%). ➤ Import Justin Brownlee backstopped the defeated Barangay with 37 points, 14 caroms, and 8 dimes while high flyer Japeth Aguilar mustered 18 points and 6 boards. ➤ Ginebra and Magnolia will resume hostilities on Monday, November 12 at Araneta Coliseum for Game 2 of their Semis matchup. Quarters: 31-39, 63-55, 86-76, 106-98. Travis 37, Lee 27, Melton 11, Sangalang 7, Dela Rosa 6, Barroca 6, Jalalon 5, Pascual 4, Herndon 3, Reavis 0, Brondial 0. Brownlee 37, Aguilar 18, Tenorio 13, Slaughter 8, Thompson 7, Chan 5, Ferrer 4, Mariano 4, Mercado 2. PBA News 2018: The Barangay Ginebra train looked unstoppable, as it flattened the NLEX Road Warriors, 111-75 to enter the Semifinal round of the 2018 PBA Governors’ Cup this Tuesday at the Araneta Coliseum. Japeth Aguilar starred for the Gin Kings with his 18 buckets and 10 boards while Greg Slaughter added in 16 markers. ➤ Ginebra led in the majority of the game numbers as they shot better from the trey territory with 13 of 29 (44%) three points total against NLEX‘s 9 of 37 (24%). The Kings also hauled 57 boards to the Road Warriors 40 rebounds. ➤ Import Aaron Fuller was the only bright spot for the Road Warriors as he finished with a double-double of 25 points and 12 caroms. ➤ The Gin Kings are on a head-on Semis collision against the winner of the quarterfinal standoff between the Blackwater Elite and Magnolia Hotshots. Quarters: 26-20, 50-36, 76-62, 111-75. J. Aguilar 18, Slaughter 16, Mercado 14, Brownlee 13, Chan 12, Mariano 8, Ferrer 7, Tenorio 7, Thompson 6, Caperal 5, R. Aguilar 3, Manuel 2. Fuller 25, Quinahan 9, Paniamogan 9, Galanza 7, Ighalo 6, Fonacier 5, Rios 4, Mallari 4, Miranda 3, Monfort 3, Baguio 0, Tiongson 0, Taulava 0, Tallo 0. PBA News 2018: Barangay Ginebra bagged the No. 1 ranking, as it demolished the Talk ‘N Text KaTropa, 112-93 to begin their quarterfinals campaign in the 2018 PBA Governors’ Cup this Sunday at the Araneta Coliseum. Import Justin Brownlee blasted TNT with his triple-double of 31 buckets, 16 boards, and 11 assists, while big man Greg Slaughter finished with 25 points and 4 caroms. ➤ Flashy guard Scottie Thompson also submitted 11 points and 8 rebounds for the Gin Kings. ➤ Barangay moved the ball better overall with 34 assists compared to TNT’s 24 total dimes and shot better with 38 of 66 shots made in field goals (57%) opposed to KaTropa’s 36 of 97 (37%). ➤ Ginebra is now the leader of the Governors’ Cup pack as they registered a 9-2 win-loss slate and are assured of a twice-to-beat advantage once the playoffs commence. The Gin Kings will battle 8th placer NLEX in the quarters. ➤ Import Marqus Blakely paced the defeated TNT with 23 points and 15 rebounds, while RR Pogoy chipped-in 22 points. Ace guard Jayson Castro also added 12 points and 12 dimes. ➤ TNT missed the services of star player Terrence Romeo who was out due to sickness. The KaTropa are now effectively out of contention in the Governors’ Cup after losing their third straight and dropping to a 4-7 win-loss slate. Quarters: 24-22, 54-45, 82-69, 112-93. Brownlee 31, Slaughter 25, Thompson 11, J. Aguilar 10, Ferrer 9, Mariano 9, Tenorio 7, Mercado 4, Chan 3, Dela Cruz 3, R. Aguilar 0, Caperal 0, Manuel 0, Caguioa 0. Blakely 23, Pogoy 22, Castro 12, Rosario 11, Reyes 8, Cruz 7, Trollano 4, Williams 2, Carey 2, Tamsi 2, Garcia 0, Golla 0, Paredes 0, Taha 0. PBA News 2018: Barangay Ginebra secured the twice-to-beat advantage, as they ravaged Magnolia Hotshots, 93-86 this Sunday at the Araneta Coliseum as a primer for their 2018 PBA Governors’ Cup playoffs campaign. Justin Brownlee powered the Gin Kings with his 29 buckets, 12 boards, and 7 dimes, while Japeth Aguilar added 17 markers and 6 rebounds. ➤ Big man Greg Slaughter also made his presence felt for Barangay as he chipped in 11 points and 9 rebounds, while veterans Sol Mercado and LA Tenorio made 9 points each respectively. 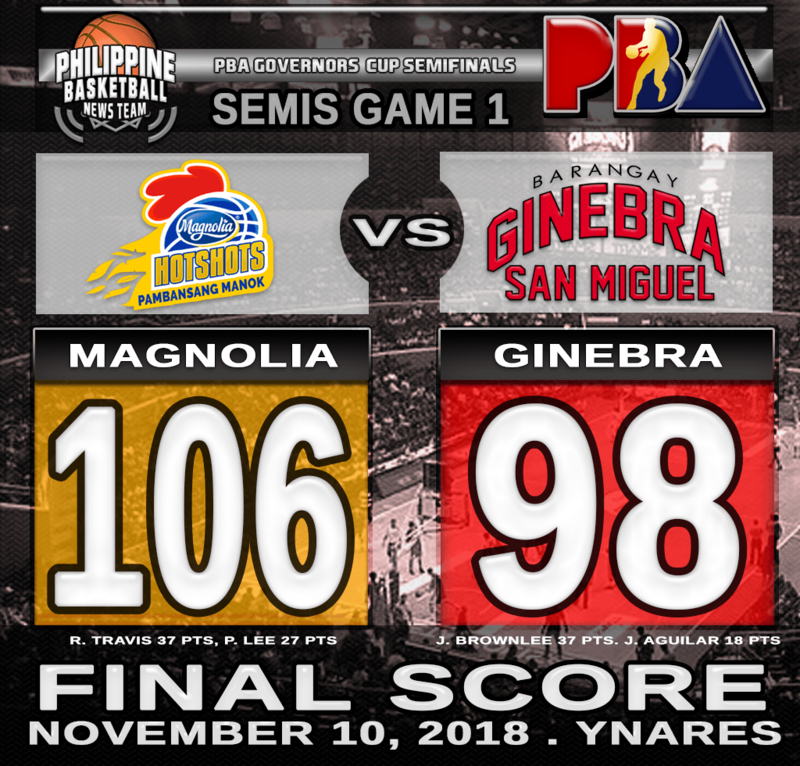 ➤ Ginebra almost lost the ballgame in clutch time as Magnolia engineered a 9-0 unanswered run to trim an 89-75 Gins lead to only 5 points with 34 ticks remaining. A late Jio Jalalon turnover, however, resulted in a Brownlee easy bucket which sealed the Ginebra win. ➤ Barangay Ginebra mastered the paint to stifle Magnolia, as they hauled 49 rebounds compared to Hotshots 47, and registered 8 swats to Magnolia’s 2 blocks total. ➤ Import Romeo Travis paced the losing Magnolia with 30 points and 7 rebounds, while clutch guard Paul Lee added 21 buckets. ➤ Ginebra is now at the top of the Governors’ Cup heap with an 8-2 record, while Magnolia went down to an 8-3 win-loss slate. Quarters: 24-15, 46-31, 69-53, 93-86. Brownlee 29, Aguilar 17, Slaughter 11, Mercado 9, Tenorio 9, Thompson 6, Mariano 6, Ferrer 3, Chan 3, Caperal 0. Travis 30, Lee 21, Jalalon 12, Barroca 10, Herndon 5, Melton 3, Dela Rosa 2, Simon 2, Reavis 1, Ramos 0, Sangalang 0, Brondial 0. PBA News 2018: Depleted Barangay Ginebra subdued the San Miguel Beermen, 110-102 this Sunday in the 2018 PBA Governors’ Cup at the Araneta Coliseum. Import Justin Brownlee once again starred for the Gin Kings with his double-double 29 points, 19 boards, and seven dimes, while Aljon Mariano added 20 buckets and 7 caroms. ➤ Ginebra is missing key players Japeth Aguilar, Sol Mercado and Greg Slaughter. San Miguel for its’ part also lost Junemar Fajardo to injury (stress fracture). ➤ The losing Beermen got respectable numbers from Christian Stanhardinger who dropped 25 points and 10 rebounds. Veteran swingman Arwind Santos also chipped-in 22 buckets and 8 rebounds. ➤ Ginebra now sports a 4-1 win-loss slate, while San Miguel dropped to another loss for a 2-2 record in the Governors’ Cup. Quarters: 22-21, 49-44, 76-70, 110-102. Brownlee 29, Mariano 20, Devance 17, Tenorio 9, Caguioa 8, Ferrer 8, Chan 7, Caperal 6, Thompson 5, Manuel 1. Standhardinger 25, Santos 22, Ross 18, Reid 13, Cabagnot 10, Nabong 8, Pessumal 6, Ganuelas-Rosser 0, Heruela 0. PBA News 2018: Blackwater Elite held past Barangay Ginebra, 124-118, in overtime to lead the pack in the 2018 PBA Governor’s Cup this Friday, at the Araneta Coliseum. Elite gunners Henry Walker, Paul Zamar and Mac Belo all drained clutch threes in the waning minutes to lift Blackwater past Ginebra. Walker top-scored for the Elite with 39 points, 9 dimes and 7 caroms, while Zamar chipped-in 17 points. ➤ Blackwater’s Mike DiGregorio sank a trey to force overtime, 110-110. The Elite also survived Justin Brownlee’s potential game-winner in the 4th quarter, as the latter’s jumper conked out. ➤ Despite the loss, Brownlee delivered monstrous numbers for the Gin Kings with his 41 buckets, 6 dishes and 4 steals, while LA Tenorio also added 17 markers and 5 assists. ➤ Ginebra missed the services of vital cogs Greg Slaughter, Japeth Aguilar and Sol Mercado who are all nursing injuries. ➤ Blackwater is now the solo leader in the Governor’s Cup with a 4-0 win-loss slate, while Ginebra succumbed to their lone loss and dropped to 3-1. Walker 39, Zamar 17, Pinto 15, Belo 14, Erram 13, Digregorio 10, Jose 6, Maliksi 6, Sumang 4, Cortez 0, Javier 0, Al-Hussaini 0. Brownlee 41, Tenorio 17, Mariano 16, Chan 11, Thompson 9, Caperal 8, Devance 7, Ferrer 6, Caguioa 0.